Dr Oliver Johnson tells Gabriella Jóźwiak about the crisis and the future of Sierra Leone’s health system. 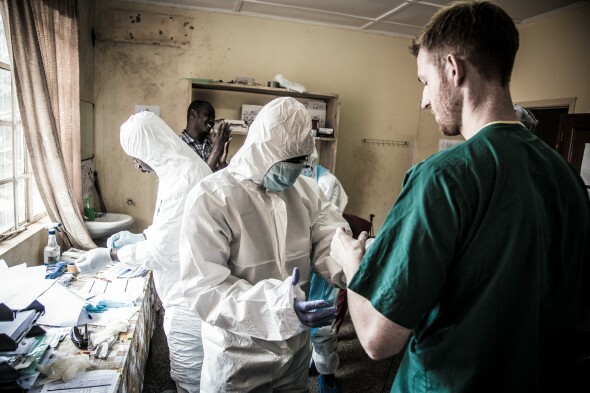 Oliver Johnson, a British doctor, is fighting Ebola in Freetown, the capital of Sierra Leone. He is the leader of a team of volunteer doctors and nurses from the Kings Sierra Leone Partnership at Connaught Hospital. They have treated people with Ebola in an isolation unit since people started getting it in March. There is Ebola now in Sierra Leone, Liberia, Guinea, Nigeria and Senegal. More than 1,550 people have died from Ebola and 3,000 more have been infected with it. Last week the World Health Organization (WHO) said there could be more than 20,000 cases before it is stopped. There is no known cure for Ebola. In this interview, Oliver Johnson talks about the situation in Sierra Leone. He says that, if there is no urgent international help, Ebola could cancel out everything Sierra Leone has achieved since the end of its 10-year civil war in 2002. In the civil war, there was a lot of damage to the health system. Hospital buildings were destroyed. And senior staff were killed or left the country. Also, many NGOs took control of health services. So people did not have confidence in the government health system, which was not strong. When NGOs leave, they often leave a very big hole, because people have become dependent on them. Government facilities become weaker when there is an NGO near that gives really high-quality care. Now with Ebola, health-service buildings are not really the problem. But more than 50 health workers in Sierra Leone, and more than 130 in all the areas with Ebola, have been infected. Two in Sierra Leone were senior doctors. Dr Sheik Umar Khan was the country’s most important virologist. Dr Modupeh Cole was one of only three consultants at the main hospital. It will be difficult to replace Khan and Cole. Many senior doctors in Sierra Leone live in both Freetown and London and a lot of them are on holiday at the moment. We do not know if they will come back to work. Many are afraid. They are afraid the hospital isn’t safe. We’re trying very hard to make people confident in the government health system, but after Ebola, it’s going to be difficult. We need to do two things. We need to make sure staff have the right training and the right drugs, aprons, soap and water. And also, we need to make a psychological effort to get good leaders in the health system to convince people that it’s safe. It depends on the international community and the Sierra Leonean government how long that takes. When you close a hospital, the confidence goes. Connaught, the main government referral hospital in Sierra Leone, is still open. But it’s a big effort to keep it open and we don’t have enough support from the international community now. There is a team from Kings here and so far we’ve kept staff confidence and kept the hospital open. The children’s hospital down the road is closed. This is an important point. Kings has stayed. Most NGOs in the country have left. They have made their staff leave, so all the long-term efforts to make the health system stronger have stopped. It will be very hard for some NGOs that left the country to come back and build those relationships again. A lot of local staff will say: ‘You left us when things got bad.’ A lot of people might be suspicious. They’ll say: ‘You told us we were colleagues and partners, but when everything was difficult you ran away’. Kings is one of the only organizations that have stayed. And that’s one of the reasons why Connaught has stayed open. The other problem now is that NGOs are taking over the health services again. Médecins Sans Frontières and the Red Cross had almost left the country here after the war. But now all those organizations are running health services again. It is dangerous to only invest in NGOs now. Then the NGOs will run the health system for a couple of years and leave. We’re back to exactly what we were trying to change: a temporary NGO, aid-run system. But we need a strong, government-led heath system that Sierra Leoneans are running and leading. Now the government is leading us well. But there is very little support from the international community. As far as I know, Kings is the only organization still working clinically in a government hospital. All the others have left, apart from the WHO in Kenema’s hospital in the interior. We need a lot more support from the international community in government hospitals, so that normal services can continue and staff can be safe and not die. We need to keep staff confident to make sure patients keep getting good quality of care and keep coming to the hospital. We don’t want to create a new NGO health service that will leave. We need NGOs to want to work in government hospitals and a lot of them are afraid. They’re saying to Sierra Leonean doctors and nurses: ‘You should go into the isolation units.’ They won’t go in themselves. International NGOs are raising money, but they do not do the real work with colleagues. If we had good control of infection here, health workers wouldn’t die. When Ebola ends, we’ll need to work on infection control and strengthening the health workforce. We’ll also need to help people trust the government health system again. Gabriella Jóźwiak is a journalist. She mainly writes about children and young people in Britain and developing countries, particularly West Africa. She has recently reported on Ebola. NOW READ THE ORIGINAL: http://newint.org/features/web-exclusive/2014/09/02/ebola-interview-oliver-johnson/ (This article has been simplified so the words, text structure and quotes may have been changed). This page was last edited on 15 September 2014, at 18:56.